Central Vacuum Connection is an independently-owned business, providing customers in Florida with central vacuum sales, installations, repairs and accessories since 1974. We offer a lifetime warranty on our products and take pride in being your experts for all things involving central vacuum units. Contact us to schedule a walkthrough of your home and a free consultation. There are many reasons to explore the investment in a central vacuum system in Florida. Central Vacuum Connection is here to explain them to you! We’re a longstanding expert in these convenient, accessible cleaning systems and have a strong track record of customer satisfaction in Florida. 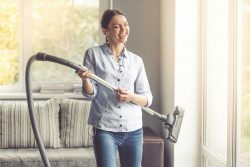 We’ve been showing homeowners just how central vacuum systems can benefit them for decades, and in that time we’ve become experts in the products we sell. From helping you find a system that meets your needs and improves your quality of life, to installing and maintaining that system, we’re the ones to call. When you choose us for sales and central vacuum system installation in Florida, you’re getting nothing less than the best. We work directly with homeowners to outfit their homes with a system that’s ideal for their needs. Then, we’ll show you how to use it, maintain it and even troubleshoot it. From new homes, to retrofits, to brand new installations, we’ll customize your installation to ensure it meets your needs. And, if there’s ever a problem, you can call us for central vacuum system repair in Florida. There’s no system we can’t fix and no problem that eludes our well-trained, highly-experienced techs! Give us a call today and learn more about central vacuum systems and the many benefits they offer—explained by professionals who know these products inside and out. We’ve been in business since 1974, with decades of experience within the vacuum cleaner industry! Our business is affiliated with the Better Business Bureau (BBB) and the national Federation of Independent Business (NFIB). We received the Angie’s List Super Service Award in 2014, 2015 and 2016! We also received Central Vacuums’ Gold Service Award of 2016, presented by HP Products Central Vacuums! We’re an Angie’s List Gold Member and Home Advisor Service Award winner. We offer free consultations and walkthroughs for customers interested in our products. Looking for a vacuum solution that’s easy to use throughout your entire living space? Central Vacuum Connection can help. Contact us today to learn more about our central vac solutions.